DRL-50 surface mounted cubicle track with DRL-400 slide carriers. Section size is 5/8" x 1/2" x .062" wall thickness. Extruded of 6063-T5 aluminum alloy with a 204-R1 satin anodized finish. Tracks are custom fabricated to shape and size in one continuous piece, wherever possible. 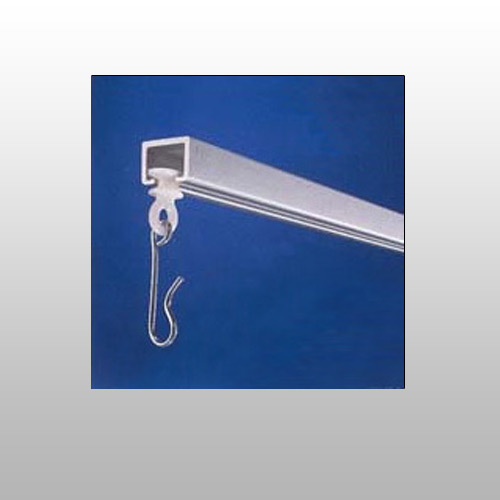 DRL-400 carriers are made of a one-piece molded nylon slide with a chrome-plated steel hook. Removable end caps are provided with all tracks. All radii are 12". This is our most economical track system and the small section size permits installation just about anywhere. Custom DRL-50 Tracks include 2.2 IFC-400 Carriers per foot. If you need any assistance or your track setup requires options that are not provided in the form below please call 1-800-791-2946 to speak with a representative.